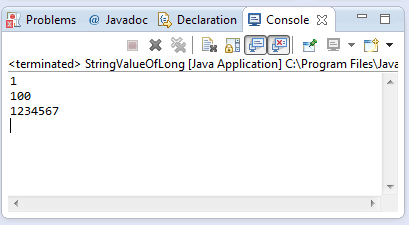 This java tutorial shows how to use the valueOf(long l) method of String class of java.lang package. This method returns a string representation of long data type. This is the same method as Long.toString(long). The String valueOf() method with argument long returns a new String object which corresponds to the string representation of the method argument. The string valueOf(long l) method is simply to get a String equivalent of int method parameter. This method be statically accessed which means we should call the method like String.valueOf(long l). This example source code demonstrates the use of valueOf(long l) of String class. Below are different examples of getting a value of long. As you would noticed we have used the unboxing functionality to transform a Long object into long primitive datatype and then get the string equivalent using the valueof method.